There will be no holes to drill, the cab mounts use existing holes. Original Tractor Cab Hard Top Cab Enclosure. Fully enclosed cab with an ABS plastic hard top. Clear shatter resistant Lexan plastic is used in the rear curtain, side doors and the windshield for maximum visibility. New hard top cab enclosure that will fit the 1023E & 1026R Compact Utility tractors. There will be no holes to drill, the cab mounts use existing holes. Part Number: 12009. We have added the installation video from YouTube. These Detailed plans are Designed for the 300 & 400 series John Deere garden tractors and can be modified for other tractors. I built this unit for plowing snow and it has really improved the comfort. New Sunshade that will fit the X300 Series lawn tractors. This sunshade removes in seconds for transporting or mowing under low branches.This sunshade isNOTcompatible with a bagger. Vinyl cover removes quickly for easy cleaning. This is for a a Curtis Cab 4 John Deere Tractor Wiper and Doors. It may also fit the other models listed in the title. Price listed is for pickup only. Free Shipping! Free 12V Heater! 1 Year Warranty! New Sunshade that will fit the 2210, 2305, 4200, 4300, 4400, 4210, 4310, 4410, 4100 & 4110 Compact Utility Tractors. This sunshade removes in seconds for transporting or mowing under low branches. Vinyl cover removes quickly for easy cleaning. 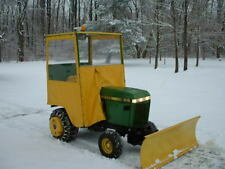 John Deere 4040 Tractor. Ertl.1/16. New In Box. Cab. I've described this model as best as I can. I can combine sales when it is possible. Part Number: RE198488. Genuine John Deere Cab Air Filter. 6130D (SN -050000), 6130D iT4. 6120E, 6125D (SN -050000). 6110D (SN -050000). 6105D iT4, 6105E. 6100D (SN -050000). 5220, 5320, 5420, 5520, 5603, 5625. AMI Part Number : AMX92005. Replaces OEM Part Number : AMX92005. Cab Caddie. John Deere® 2WD Tractors - 4230, 4430, 4630, 4240, 4440, 4640, 4840, 4050, 4250, 4450, 4650, 4850. One piece molded design in durable black poly. Fits John Deere Tractor(s) 4030 (Sound Gard s/n 63624-later), 4040 (Sound Gard s/n 185706-earlier), 4230 (Sound Gard s/n 63624-later), 4240 (Sound Gard s/n 185706-earlier), 4430 (Sound Gard s/n 63624-later), 4440 (Sound Gard s/n 185706-earlier), 4630 (Sound Gard s/n 63624-later), 4640 (Sound Gard s/n 185706-earlier), 4840 (Sound Gard s/n 185706-earlier all using 11" seat well). Fits John Deere Tractor(s) 1640, 2040, 2140, 2320, 2350, 2550, 2750, 2940, 2950, 3040, 3140, 4030, 4040, 4050, 4055, 4230, 4240, 4250, 4255, 4430, 4440, 4450, 4455, 4555, 4560, 4630, 4640, 4650, 4755, 4760, 4840, 4850, 4955, 4960, 8430, 8440, 8450, 8630, 8640, 8650, 8850. Part Number: 12110. This hard top cab enclosure is not a genuine Deere item. It is made in the USA. It carries a one year warranty. 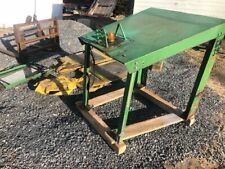 Original Tractor Cab Hard Top Cab Enclosure. There will be no holes to drill, the cab mounts using existing holes. New hard top cab enclosure that will fit the X400, X500 & X700 heavy duty lawn and garden tractors. There will be no holes to drill, the cab mounts use existing holes. This cab enclosure will fit the following models. Replaces OEM Part Number : R237130, AR86111, AR89830, RE240205. John Deere® Tractors - 1640, 2040, 2040S, 2140, 2350, 2550, 2750, 2940, 2950, 3040, 3140, 4040, 4040S, 4050, 4055, 4240, 4250, 4255, 4350, 4440, 4450, 4455, 4555, 4560, 4640, 4650, 4755, 4760, 4840, 4850, 4955, 4960. Nice collectable John Deere 1/16 scale 4520 Diesel tractor. Duals and cab. Used for display only. Remains in great condition. FITS JOHN DEERE MODELS: 240, 250, 260, 270, 280 MODELS. CONDITION: (USED) NORMAL SIGNS OF WEAR AND TEAR FOR ITS AGE. Replaces OEM Part Number :AR74143, AL41448. ® Tractors -2140, 2350, 2355, 2550, 2555, 2750, 2755, 2850, 2950, 2955, 3040, 3055, 3140, 3150, 3155, 3255, 4030,4040, 4050, 4055, 4230, 4240, 4250, 4430, 4440, 4450, 4555, 4560,4630, 4640, 4650, 4755, 4760, 4840, 4850, 4955, 4960, 8430, 8440,8450, 8640, 8650.